This is the little lamp mon amour has missed in it's new home. 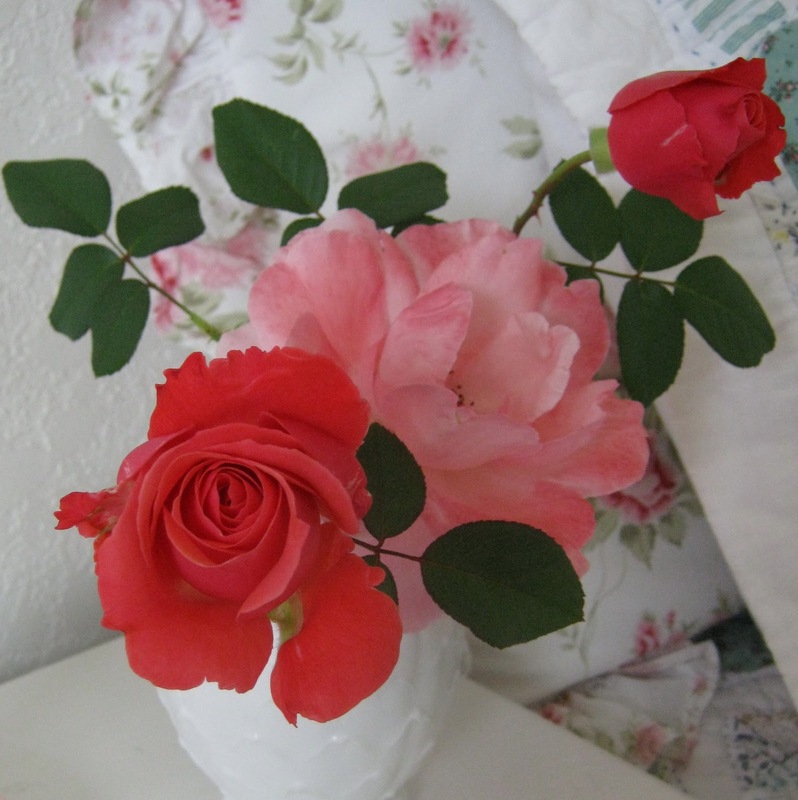 This is the quirky milkglass vase that I bought for my roses at the Vintage Marketplace. love your photos, the roses and fabrics are lovely together! 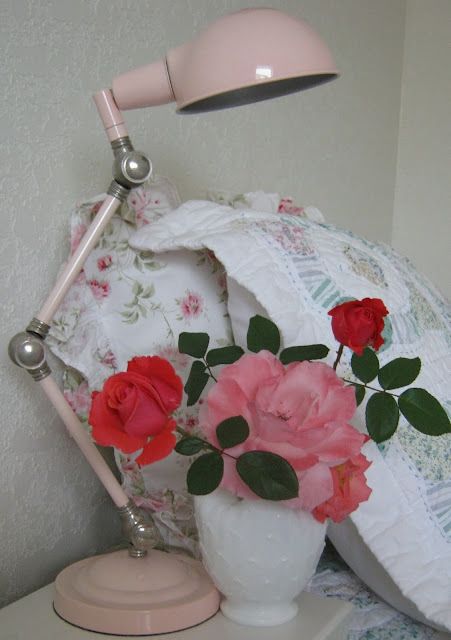 The beautiful roses from your garden look lovely by the lamp and pillows! Your photos are so well done! Oh, my sweetest friend!!! You made my day yesterday with your comments, you know? Thank you so much for what you said about my interview. You're amazing! 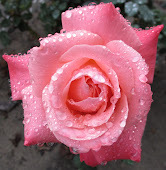 Love your roses... they the most beautiful ones! These are so pretty. Can I have one for my home, please?? They are certain to spice things up. so beautiful, I like so much!!! Pretty in pink today. They all look fantastic together. The lamp, the fabrics and of course your wonderful roses. Love it all. Hope you are having a lovely week. 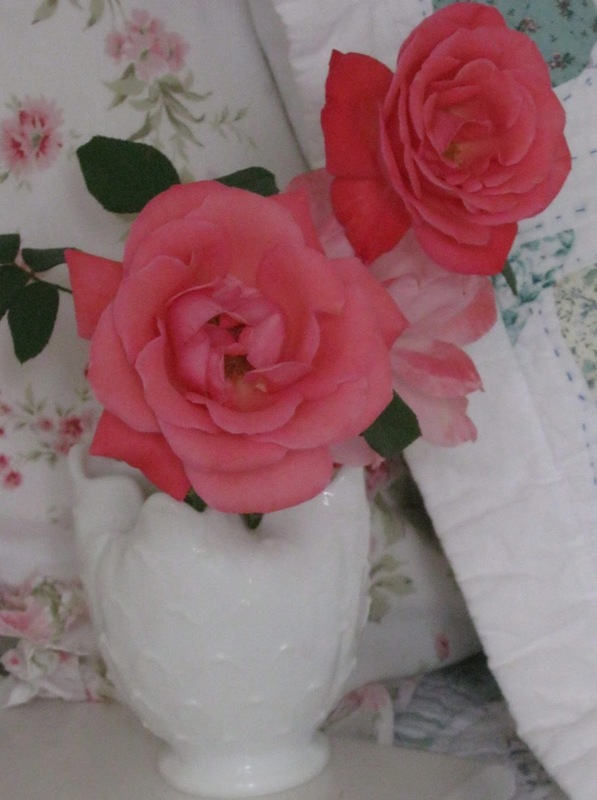 What a pretty floral arrangement and your bedspread is gorgeous! Everything looks so pretty, I love the milk glass vase. This is all so wonderfully shabby chic. It is like looking at a Rachel Ashwell ad:) Beautiful. 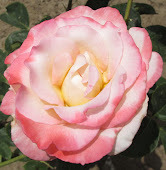 I hope you're doing well and have a beautiful day!!! Gorgeous! 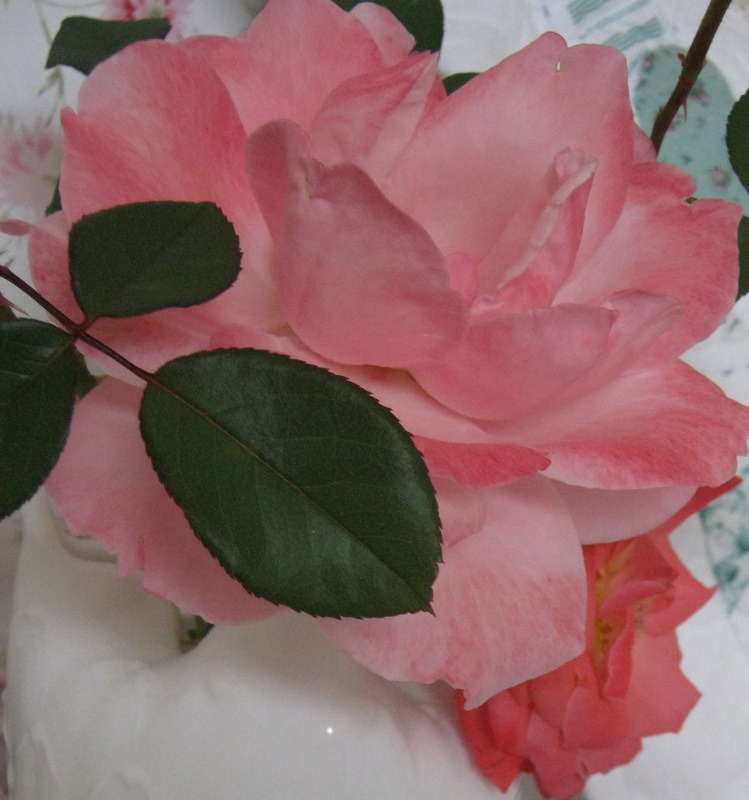 And that milkglass vase ~ swoon!!! Really breathtaking...I can almost smell them! 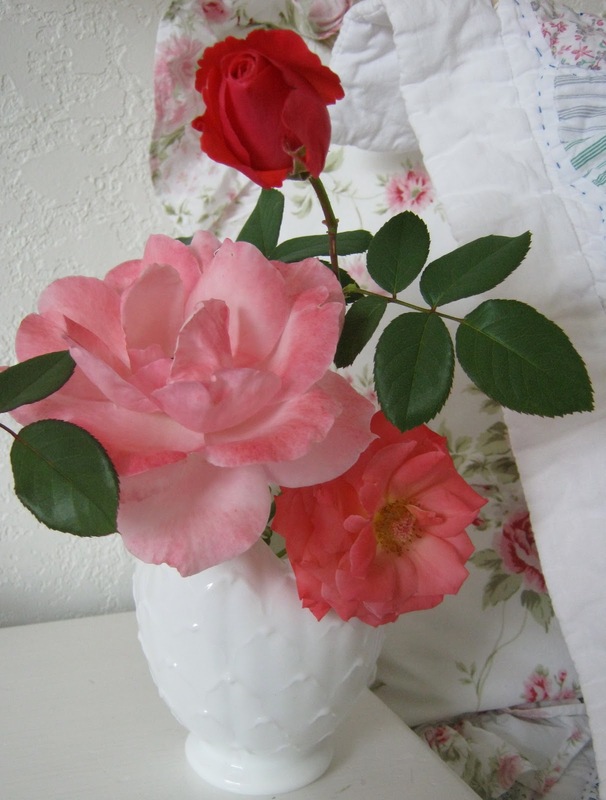 Oh your roses look so pretty in your milk glass vase! I agree all of the colors look so beautiful together!! 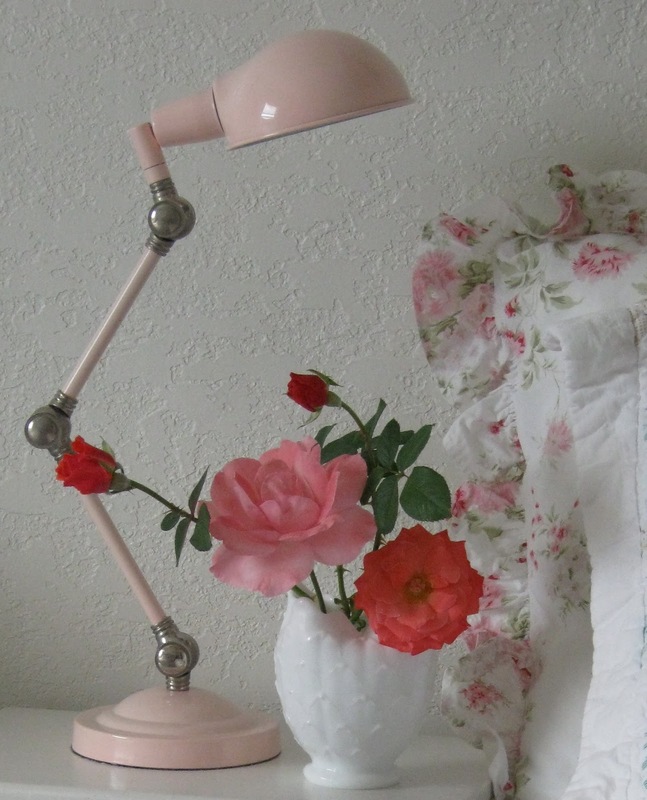 How beautiful--I love that pink lamp!